Welsh housing associations supported a total spend of £2.3bn and supported 23,000 jobs in 2017/18, according to new economic impact analysis for Community Housing Cymru (CHC). The analysis by Beautfort Research found that associations directly supported 9,000 full-time equivalent jobs and spent £1.2bn, with 84% of the spend staying in Wales. The three biggest expenditure items were direct labour costs (30%), construction (24%) and maintenance and repair (23%). The other £1.1bn of spending and 14,000 jobs came indirectly via suppliers and the impact of additional wage spending elsewhere in the Welsh economy. Total gross value added (GVA) from the direct and indirect spending was £886m, an increase of 20% on last year. Total sector income was £1.2bn, with associations receiving £122m from Welsh Government in social housing grant and £60m in other grants and the rest coming from other sources including rents, service charges and sales. According to the report, that means associations brought in £5.69 for each £1 of Welsh Government funding. The report found that CHC members provided 1,876 additional homes in 2017/18, down 26% on 2016/17. However, they expect to make 3,045 homes available in 2018/19, putting the sector on target to meet its target of 12,500 additional homes over five years agreed in a pact between Welsh Government, CHC and the Welsh Local Government Association. Estimated regeneration spend was £445m in 2017/18, down from £478m in 2016/17. Within that, community regeneration spending was £23m, up from £21m the previous year. 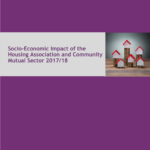 ‘This report shows that Welsh housing associations are in it for the long term, and yet again delivering an economic and social boost in local communities across the country. 84p of every £1 spent by a Welsh housing association stayed in Wales last year, and this investment by organisations that are rooted in local areas is more important than ever.